The problems that come along with clogged gutters can impact many facets of the home. Unfortunately, many original gutters clog with ease and need regular maintenance. For homeowners who seek clog-free gutters the choice is simple. A clog-free gutter system is the solution. Otherwise, you can expect a biannual cleaning ritual. This might include hoisting rotting leaves and living organisms from the gutters. Having original gutters on the home may mean uncovering an organic microsystem. Overflowing gutters can cause other problems on the home, too. Forgoing a bi-annual cleaning can lead to much bigger issues. If you dread cleaning gutters, there is a solution. You’ll want to replace them with a clog-free gutter system. In your new gutters, you’ll find a seamless trough that won’t pull away from the home or split at any seams. The biggest benefit to having seamless gutters is that they won’t leak. Instead, the water runs smoothly off the home and down the line to the downspout without any clogs. Even worse, there are a myriad of dangers when it comes to cleaning gutters. Being at the top of a ladder can lead to a fall and significant trauma. In fact, it’s estimated that 165,000 people fall from a ladder each year according to U.S. Consumer Products Safety Commission. Of those, 90,000 of them require emergency medical treatment. Contrarily, homeowners that choose not to clear out gutters can have major issues. 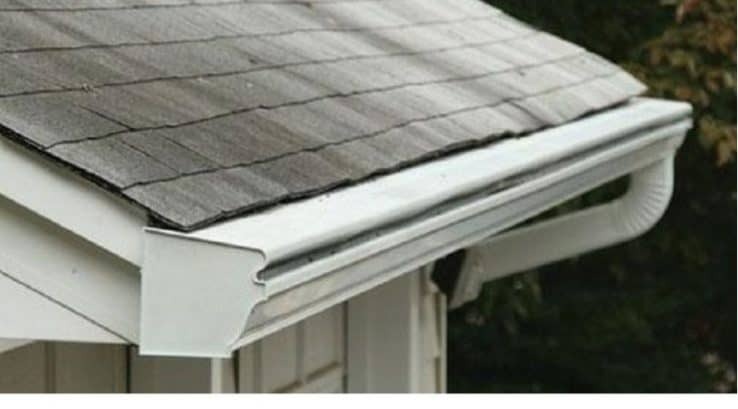 In the following images, we walk through common issues that can come up in gutters. These images all take place in fair weather, but another way to check on your gutters is in the rain. You’ll easily be able to follow the water trail to tell if it is leaking or affecting anything below. Clogged gutters grow small plants in springtime. A gutter attachment cover not only caved in and stopped blocking leaves, but it also pulled the gutters off the house. When the gutter dripped, it cracked the driveway. Fixing the driveway won’t fix the symptom, so the gutters must be fixed, too. This leak from the gutter caused the foundation of the house to split. Mold can grow behind the fascia inside the attic space if the gutters are not working properly. This hood fell apart on the gutter, allowing leaves back inside the trough.